3rd Annual Sanghursh Memorial Football Tournament held on Saturday and Sunday, 2nd and 3rd January’ 2016 at the Sports Complex, East Vinod Nagar Mayur Vihar, Phase-2, Delhi. More than 60 teams were registered from school teams, football clubs, and academies from whole East Delhi, Noida and Ghaziabad. Dr. Vinod Bachcheti, CMD DPMI and Himalayan News, Aam Adami Party MLA from Kondli Mr.Manoj Kumar, Area Counselor Mr.Devendra kumar, Sports Authority of India’s Sr. Sports Coach Mr.Nirmal Singh and friends, relatives parents of players and others personally attended the event and appreciated players and organizers for their dedication and attachment with the football game. Dr. Bachcheti and Mr.Manoj Kumar appreciated the arrangement of the tournament and player’s sports spirit and assured to extend their full support in future whenever such events are organized by the academy. Mr.Manoj Kumar also assured the players and academy management to make his all efforts to open a Sports Stadium in Mayur Vihar, Phase-III to promote all the games and sports at the single platform with the support of Delhi Government within a year. Opening Ceremony on Saturday 02nd January’2016 at 8.30 a.m.
Matches started on knock out round basis continuously on 2nd and 3rd January’2016. Final Matches started at 3.30 p.m onwards on Sunday, 03rd January’2016. Winning Team Under 12 age group- Sanghursh Sports Academy, Delhi. Prize Distribution started at 4.30 p.m onwards. Vote of Thanks : The Managing Trustee of the Academy Mr.G.S.Chauhan, Trustees Mrs. Sarita Chauhan and Ipshita Chauhan expressed his gratitude for the support of Mr.Shivlochan, Manager of the sports complex for giving this playground for the football tournament, Mr.Pawan Kumar Tyagi, Patron of Technical advisor of the academy for managing this tournament, Team of Referees, Support staff of the sports complex, academy’s coaches Mr.Gopal and Rahul, Eminent Guests, players and their parents, coaches and managers of participating teams, relative, neighbors and who have been personally with us to organize the event and made it a success. Sanghursh Sports Academy; a Memorial Trust has completed its second mile stone on 27th december’2014 by organizing a two days football tournament at district level in East Delhi at Salwan Public School, Mayur Vihar, Phase-3, Delhi. More than 48 teams from different public schools like St. Mary’s School, Salwan Public School, Ryan International School, Somerville School, Evergreen Public School, and Kerala Public School, many football clubs, academies and NGOs participated in this tournament played at Salwan Public School. 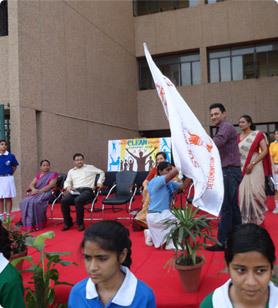 The event was inaugurated by the Principal of Salwan Public School Mrs. Kiran Mehta and former MLA Mr.Amresh Singh and attended by Local RWAs officials, sports coaches of the schools and teams and public in large. The organizers and conveners were really overwhelmed with the interest of players and public towards Football Game. Closing Ceremony was chaired by well known international footballer and Indian Team Coach Mr.Anadi Barua and MCD Counselor Mr. Rajeev Verma. Many prizes and awards were given to the players of this tournament by the organizers and sponsors. Managing Trustee of the Academy Mr.G.S.Chauhan had formed this academy two years ago in the memory of his young son Sanghursh who had been a football player of Somerville School and DDA and had a dream to set up a football academy. The Academy has engaged professional coaches to run coaching institute in Mixed Housing Complex play ground in Mayur Vihar, Phase-III. Inaugurated By: Well known Hockey Player Shaileder Singh nick name is Shaily, Singham Bravery award winner in 2011, presently coaching Delhi women hockey team and DU’s Girls Hockey team for last two years. Mr. Singh Born and brought up in Delhi. He has played a role in Shah Rukh Khan’s Hindi Movie “ Chak De India. He had played 9 matches for India and won 2 Gold Medal s and 1 Bronze Medals for the Indian universities. Mr. Singh also played a test series from Indian team with Australia. And: Mr. Benny Joseph, a well known name for Football players. Presently Executive member of Delhi Football Association. Benny Sir also coaching football team of St. Columbus School of Delhi. He is also member of Delhi State Football Team selectors.. Trustee Mr.G.S.Chauhan has formed a football team locally in Mayur Vihar, Phase-III, Delhi to promote football players for a better training and practice. The trust will organize football tournaments with other teams from time to time. The trust will give away prizes and awards to the winner teams. 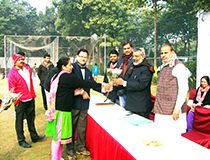 A grand tournament organized by Sanghursh Sports Academy with 20 odd teams from different public schools, Clubs and Associations on 19th January’ 2014 in the Central Play Ground of Mix Housing Complex, Mayur Vihar, Phase-III, Delhi – 110096. Team Manager, Mr. Pavan Kumar Tyagi and his team managed the tournament so professionally that all the viewers, guests, players and coaches appreciated their efforts. Tournament was inaugurated by Mr. Rajeev Verma, Counselor, Mayur Vihar, Phase-III, Advocate Mr.Satender Kumar, Mr. Sonu Juneja, and Mr.Girvar Sharma.